Despite all the care moving or relocation services teams show for your household goods, accidents can happen all the time during such processes. Claims are frequent in cases of relocation or moving, and the interesting fact is that often, homeowners do not even realize which are the risks that threaten their belongings while in transit, in the moving process. Moving or relocation can easily bring peace of mind, homeowners knowing that their belongings are safe and properly handled. 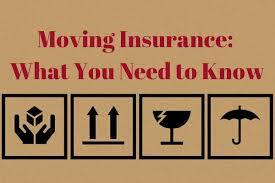 The good new is, that there are insurance options out there that can cover many relocation risks. Often, rental or homeowner insurance policies do not cover one’s possessions while in transit and this is the trickiest part: knowing what your insurance policy covers and what not. The question is not whether you need a moving insurance policy, but what would be covered by one and what to pay attention to when signing a contract for such insurance. As we stated, moving companies can be very careful with your belongings, but accidents can happen, and no matter if in 99,99% cases the moving company has successfully offered their services, there still is that 0,01% and of course, you want to focus on prevention, rather than repair. It’s very good to know from the beginning that moving and relocation companies do not offer insurance in its classical definition. Tariff based loss or damage liability are the core elements in moving insurance options and policies, and in the classic insurance situation, they would represent the “valuation”. Two of the most critical types of coverage are cargo and catastrophic coverage. Cargo coverage is appropriate for individual items’ damage or loss. For example: one of your table’s legs breaks during the moving process. It will be covered by the cargo coverage; at the same time, it’s very useful to know that cargo coverage includes catastrophic coverage. This type of coverage will provide coverage just in case of specific catastrophic events, but it is not similar to cargo coverage, as it does not include it too.In many situations, insurance coverage is tailored to meet client’s requirements and needs. In case a product is damaged, the insurance policy will allow for the reparation to be paid, and if the specific item cannot be repaired, the insurance policy will be used to replace it. There are two main models for moving companies: those who provide only the containers and the trucks you need to move and you load and unload (self-moves), and those moves that are performed by professional moving companies (these companies offer you both the transportation and a team of people that will load and unload your belongings). The latter option should always offer moving or relocation insurance, as there will be moments when your household belongings will be in their only custody, and since an accident can happen, both you and the company should be covered. When meeting and discussing the terms of service with your moving company, you should determine very clearly how much liability coverage they would provide in case of property damage or even loss. Checking the moving contract is a must as you have to value your possessions, and by comparing the total value of your belongings with the maximum value of moving insurance that will be paid in case of damage, you will be able to figure out if a company is the right one for your moving/relocation process. Another critical aspect to keep in mind when choosing a moving/relocation insurance policy would be to find out how long does it take to submit a claim; company’s reputation is also important! All in all, we hope you will find the best moving (relocating) insurance company, that will offer you top quality services and the possibility to better preserve your belongings. Keeping in mind the aspects presented earlier, we are definitely sure you will make a good, informed choice.